We have assembled five beautiful beading projects that all incorporate handmade lampwork glass beads to inspire your jewelry-making with glass beads. Whether you love to do stringing or enjoy the serenity of off-loom bead-weaving, you’ll find a project in here to capture your imagination. In these projects, hot glass is carefully layered and shaped to result in a striking handmade glass bead for you to use in your jewelry-making projects. 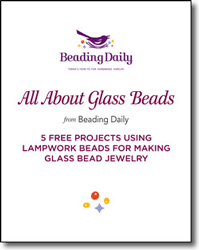 If you are interested in creating beautiful designs, the experts at Interweave compiled five free projects for glass beads to get you started in, Glass Bead Discoveries: 5 FREE Projects using Lampwork Beads for Making Glass Bead Jewelry. Lampwork beads can be created in any shape or color imaginable, and today’s lampwork glass bead artists are always coming up with beautiful and innovative new designs for our handmade jewelry and beading projects. 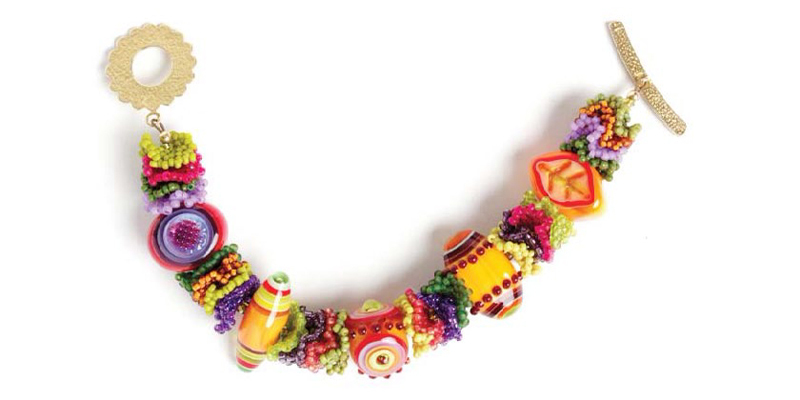 Download this free beading lesson and begin creating necklaces and handmade bracelets sure to get noticed. We are excited to present five beautiful projects for lampworked beads, all free! What projects involving glass beads are inside? There is a commonly held belief in the bead and jewelry world that you can never have too many tools. However, it’s even more important to have the right tools. Any aspiring bead maker who has had a well-meaning friend or relative give them a welding torch and welding glasses as a gift knows this. Their heart may be in the right place, but you need bead making tools for making beads. The following checklist includes a breakdown of what you’ll need to get started, using two commonly used torches. 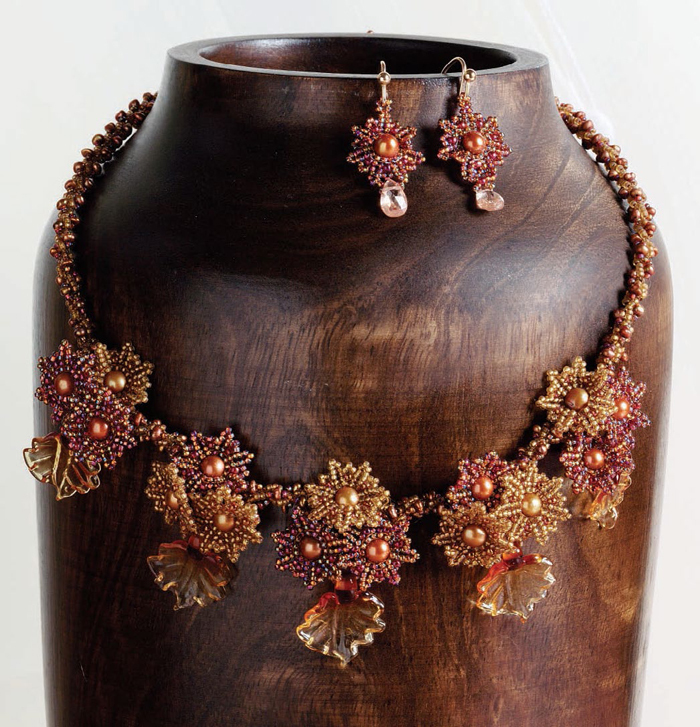 Incorporating leaves she created in her glass studio, Lisa Kan designed this intricate necklace using a variety of beadweaving techniques. It hangs delicately at the collarbone, evoking the splendor of autumn. Quickly stitch up the matching earrings for an eye-catching set. 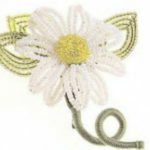 Look closely and you’ll notice the blooming floral patterns within these beads. This step by step tutorial will teach you just how you can do the same at your home kiln. 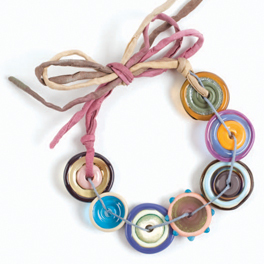 Create a fun bracelet by connecting colorful lampworked beads with waxed linen, then finish off with a hand-dyed silk-cord bow. What could be simpler? This bracelet shows off some lovely flat handmade lampwork glass disc beads. The combination of bold colors mixed with silky ribbon makes for a fun, feminine bracelet. Twelve colors of peyote-stitched seed-bead discs pay tribute to beadmaker Sarah Moran, who used these colors when making this set of lampworked glass beads. Cheerful colors and the visual movement of the seed beads put one in the mood to dance. 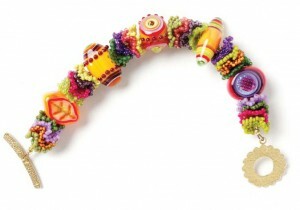 With its ruffles and sassy colors, this sumptuous bracelet is really just a celebration of the lampwork! 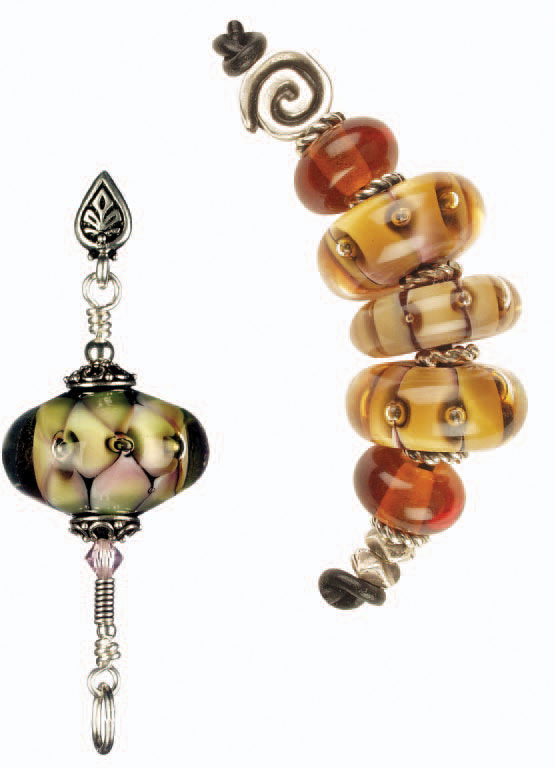 Using lampwork beads in our jewelry-making projects can be a challenge. Handmade lampwork glass beads can be somewhat heavier than other types of glass beads, and their edges can easily cut even the heaviest of beading threads or cause wear on beading wire when strung in a glass bead necklace or bracelet. So dive in to your bead stash and dig up those lovely handmade glass lampwork beads that you’ve been hoarding! With these five free beading projects in Glass Bead Discoveries: 5 FREE Projects using Lampwork Beads for Making Glass Bead Jewelry using lampwork glass beads, you’ve got a range of options and techniques for showcasing these beautiful glass objects. 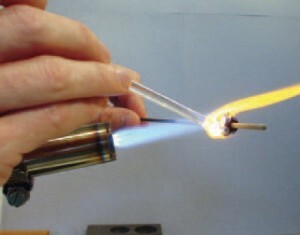 Find that special lampwork glass bead in your collection and turn it into a beautiful piece of handmade jewelry today!